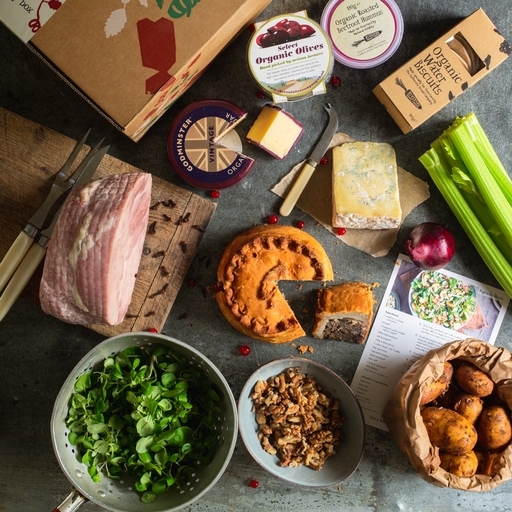 Our organic Boxing Day box contains everything you need to keep the festive spirit flowing. A 1.5kg cooked ham centrepiece, a 2lb pork pie, vintage cheddar, moreish water biscuits, beetroot hummus and Kalamata olives. Lastly, we’ll give you all the ingredients and a recipe card to make a festive salad with blue cheese and walnuts. How’s that for a vibrant spread? Feeds 6+. Meat storage: Keep in the fridge and use by the date on the label, or freeze on the day of delivery. Minimum use by date 27th December. Once frozen, defrost thoroughly and do not refreeze once thawed. Our tender ham comes from Helen Browning’s traditional breed Wiltshire pigs. The chunky beast of a pork pie is handmade to our recipe by Adams & Harlow in Lincolnshire. Water biscuits come from award-winning organic bakers The Authentic Bread Company. Vintage cheddar is Godminster’s finest, Kalamata olives are from The Real Olive Company, and hummus is made by Natural Vitality with our very own Riverford beets. Cooked ham: Pork, sea salt*, sugar, preservatives (sodium nitrite*, potassium nitrate*). Pork pie: Pork (32%), Wheatflour (Wheatflour, Calcium Carbonate*, Iron, Nicotinamide*, Thiamin*), Water*, Pork Lard, Breadrusk (Wheatflour (Wheatflour, Calcium Carbonate*, Iron*, Nicotinamide*, Thiamin*), Water*, Salt*, Yeast*), Salt*, Pork Gelatine*, White Pepper, Thyme, Sage, Black Pepper, Nutmeg. Godminster vintage cheddar truckle: Pasteurised cows milk, salt*, cultures, vegetarian rennet. Water biscuits: Wheat Flour (Wheat, Calcium carbonate*, Iron*, Niacin*, Thiamin*), Olive Oil, Water*, Salt*. Kalamata olives: Kalamata olives (88%) (olives, water*, sea salt*), cold-pressed sunflower oil. Beetroot hummus: Chickpeas (54.72%), filtered water*, beetroot (20%), extra virgin olive oil, lemon juice, tahini (sesame), garlic puree (garlic, citric acid*), salt*. Blue cheese & walnut salad recipe card and ingredients: Onion, salad potatoes, walnut pieces, celery, watercress, pea shoots, lemon, Dijon mustard (water*, spirit vinegar, brown mustard seeds, sea salt*), Stilton cheese (pasteurised milk, salt*, cultures*, vegetarian rennet*).